With dozens of critically acclaimed restaurants, nonstop entertainment, and easy transportation, the lure of Virginia’s bigger cities is obvious, but less likely are the quaint and cozy small towns. Southwest Virginia has many options in this category, offering a quiet getaway with tons of character and friendly locals to make it worth your while. These five small towns beckon you to come stay a while and experience the laidback charm of Southwest Virginia. The small town of Coeburn sits along the Guest River with the Jefferson National Forest just south of the town border, providing ample outdoor activities for visitors. The High Knob Lake Trail and Little Stony National Recreation Trail are two of the popular hiking spots in the area, and cyclists head to the Guest River Gorge Trail, a scenic “rails-to-trails” pathway that runs along the river. Coeburn recently partnered with the neighboring town of Saint Paul and Spearhead Trails, an ATV and multi-use trail system in Southwest Virginia, to add a trailhead that offers access to the Mountain View Trails, one of the trails that winds through about 100 miles of the region. Known for its beautiful downtown, this mountain gem features antique lamps, brick sidewalks, and several pedestrian bridges. Coeburn is also known as an artistic haven and is part of the Lonesome Pine Artisan Trail in Wise as well as a member of the ‘Round the Mountain Artisan Network. The Historic Lays Hardware Center for the Arts is part of the famed Crooked Road, which pays tribute to local musical legends like the late Dr. Ralph Stanley, himself a longtime resident of Coeburn, and Appalachian music culture as a whole. Every Friday night, the venue hosts musical talents from the region and informal performances are offered most Thursdays. Where to Stay/Eat: When planning a visit to Coeburn, consider staying at the nearby Inn at Wise, located about 8 miles west of the downtown area, and stop at Moon Dog Brick Oven for a bite to eat. Looking for a quick but delicious takeout spot? Coeburn’s Frosty Bossie is known for their burgers, chili, shakes, and ice cream. Pulaski has several historic stops worth a visit, including the Pulaski Theatre, a recently restored historic theatre that hosts concerts, live stage performances, and children’s shows. Another spot worth a visit is the Pulaski Railway Station, a historic train depot built by the Virginia-Tennessee Railroad in 1888 and nicknamed the “Grand Old Lady of Pulaski”. While much of the depot was destroyed in a fire, a historical restoration managed to salvage the original stone walls, preserving this important piece of Southwest Virginia history. A few miles southeast of Pulaski, the Draper Mercantile has been a favorite spot for locals for over 125 years, frequently hosting live music, workshops, and special events. You can also shop a selection of locally sourced foods and artisan wares in the Draper Mercantile Marketplace. Pulaski is also well known as an outdoor recreation destination, with New River Trail State Park and Claytor Lake just a few miles away. The Dora Trail connects the New River Trail to downtown Pulaski, where cyclists and hikers can explore along the banks of the picturesque New River. Where to Stay/Eat: Swing by Al’s on First for a chance to try some Southwest Virginia flavors, and book a room at the Jackson Park Inn for an overnight stay. One of the oldest communities in Southwest Virginia, Tazewell was first named Jeffersonville due to Thomas Jefferson also being elected as the third President of the United States the same year (1799) that the town was founded. Eventually renamed Tazewell in 1892, the town is well known for the surrounding scenery. Take in the views from the car (or motorcycle for a real adventure!) when you drive on the Back of the Dragon, the moniker given to Route 16 due to its more than 300 winding curves in about 32 miles. 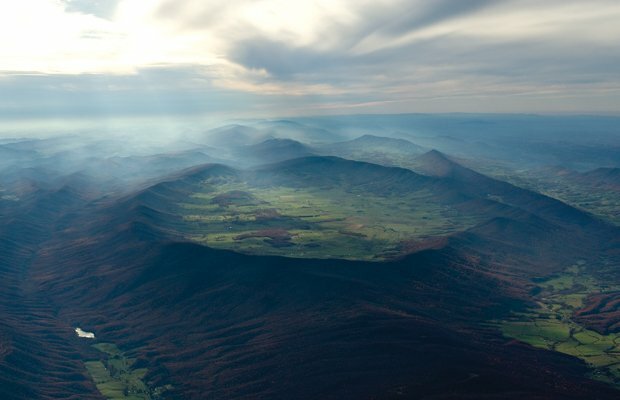 The route has spectacular views of the Appalachian Mountains, especially in spring and fall. For even more stunning scenery around Tazewell, drive the Mountain Heritage Loop and see Burke’s Garden, an ancient mountain that collapsed in on itself, creating a massive bowl in the earth. The site is often referred to as “God’s Thumbprint” due to its shape and epic proportions. End the loop at the Crab Orchard Museum to learn about the cultural history and mountain heritage prevalent in Southwest Virginia. For an interesting dive into farm life, head to Sandy Head Ostrich Farm, a farm open for educational tours where you can see sustainable farming techniques of alternative livestock, including emu, ostrich, and geese. Where to Stay/Eat: Enjoy a rustic yet upscale dining experience at Seven Restaurant in Tazewell or grab a more casual bite at Fisher & Company, a family operated barbecue restaurant housed in an old general store building across the street from the Crab Orchard Museum. Craft beer fans should stop by Painted Peak Brewing Company and Tap Room on historic Main Street in Tazewell, where they can sample craft brews thoughtfully paired with cuisine that highlights the culinary arts of the Appalachian region. Stay at Foxtail Orchards Cabins & Campground, located at the gateway to the Back of the Dragon in beautiful Thompson Valley. Floyd is home to the internationally-renowned Floyd Country Store, a general store that doubles as a live music venue, celebrating Southwest Virginia’s deep musical roots, especially in bluegrass and old-time music. Visit on the weekends for the Friday Night Jamboree, a family-friendly live music event that features different artists each week. Although only occurring once a year, Floydfest is another music event that draws people to the area from all over the world. This four-day music festival hosts big name artists like Gov’t Mule, Old Crow Medicine Show, and Foster the People, all set against the awe-inspiring backdrop of the Blue Ridge Mountains. In addition to music, the festival offers local arts, food, and craft lessons that give a comprehensive overview of Southwest Virginia culture. Make sure to snap a picture at the Floyd LOVEwork at the Jacksonville Center for the Arts, made up of quilts designed and sewed by local quilt makers. Where to Stay/Eat: Stop in to Dogtown Roadhouse for a meal, or get a quick bite at the Floyd Country Store. Get a unique lodging experience when you spend the night at Floyd Yurt Lodging, a 30-foot circular yurt with a full kitchen, bathroom, bedroom, and spacious loft area, or book a stay at the Hotel Floyd, an eco-friendly upscale hotel in Downtown Floyd. At night, you can take in the incredible starry skies through a five-foot clear dome in the middle of the yurt roof. A vibrant small town near the Kentucky/Virginia border, Clintwood is best known for the Ralph Stanley Museum and Traditional Mountain Music Center, a museum dedicated to the life and music of Dr. Ralph Stanley, a legend in traditional Appalachian old-time music. The exhibits also detail musicians influenced by Stanley’s music, including Ricky Skaggs and Patty Loveless, and the history of the genre’s ties to Southwest Virginia’s Appalachian Mountains. Like most towns in Southwest Virginia, Clintwood is surrounded by natural beauty. Drive Route 611, the Cumberland Mountain Scenic Drive, for a memorable trip through the gorgeous mountain landscape. Discover this beauty on-foot with a hike to Birch Knob Tower in the nearby Jefferson National Forest. From the top of the tower, which is 3,144 feet above sea level, you’ll have uninterrupted panoramic views of Kentucky, West Virginia, Virginia, North Carolina, Tennessee, and on a clear day, Ohio. If you’re looking for even more outdoor scenery, plan a stop at Breaks Interstate Park to see the largest canyon east of the Mississippi, appropriately called the “Grand Canyon of the South”. Where to Stay/Eat: Stay at the Ralph Stanley Museum, which has a two-bedroom suite above the museum. The accommodations can be rented either as a suite or by the bedroom. Eat at La Casa Mexicana in downtown Clintwood. Virginia has countless small towns that offer charm, hospitality, and a whole lot of fun. From small towns for outdoor lovers to the best foodie destinations, discover what makes Virginia’s small towns an excellent choice for an unforgettable vacation. You may want to update the restaurant listings for Floyd Co. In this article. Oddfella’s is closing and Blue Ridge Restaurant is hardly ever open anymore. If you plan to drive through Coburn and you have out of the areatags, expect to be stopped by local police. Due to high drug use and low local revenue, about every car from of of town is stopped for a “fishing expedition”. Clintwood isn’t much better. They were both great little towns once. They could be again. The picture of Coeburn is very old. The downtown area is almost deserted now. My family is from there and it is so sad to see what has happened to a once prosperous town. Floyd Country is where I was born. Mybroots run deep there. I was born at Terry’s Fork, Virginia in Floyd County.